Joanna Pierce looks at the importance of castles in consolidating the Norman presence in medieval Ireland. “The establishment of the new English lordships saw a massive building programme of castles”, writes Tom McNeill. Never before had the Irish landscape held so many constructions of this scope and magnitude. The Normans came from a castellated society; castles were their defensive and offensive structures, their homes, and the symbols of their power. Within five years of Strongbow and the first Normans landing in Ireland earthwork castles were springing up, and in a further five, work was beginning on some of the earliest of the great stone castles. The years between 1177 and 1310 saw the construction of some of the greatest of the Norman castles in Ireland, indeed the latter half of the thirteenth century was the apogee of castle building. When the Normans first landed in Ireland in 1169, it was for the purpose of aiding Diarmaid Mac Murchada in the reclamation of his lands. Their motives were not altruistic, it was an alliance out of which the knights themselves expected to profit. But they did not arrive as part of a planned conquest of the island of Ireland, or a royal invasion. Although Henry II did visit Ireland in 1171 in order to establish his authority over both Norman adventurers and the Irish, and in 1177 designated his son John as king of Ireland, he did not bring the country under a single, centralised control. In fact the Kingdom of Ireland was not officially declared until the 16th century. John and his successors remained Lords of Ireland instead. The result of this was the growth of individual lordships, such as that of Hugh de Lacy in Meath and John de Courcy in Ulster. These lords were reliant on their own aggression for laying claim to their lands, their own defences for securing them, and their own authority and centres of control for establishing their dominance over an area. Castles, by virtue of their defensive and offensive capabilities, symbolic status, and situation as power centres of the lords were indispensable in establishing this. Writing contemporaneously with the arrival of the Normans, Giraldus Cambrensis advised that the part of the country which is less remote – east of the River Shannon – “should be secured and protected by the construction of many castles”. In establishing control over the country argued for a system of strategically placed castles, in relatively close proximity, which would create a strong front of castles across the landscape. However, the kind of building programme which Giraldus advocated would have required a pre-planned formula for the takeover of the country by some variety of governing or deciding body. As this was not the case – the Norman invaders were independent and quarrelsome actors – it seems more likely that castles were used to secure the land once it had already been seized. A depiction of a Norman motte and bailey. In truth it could only have been when a lord was relatively secure in his lands that he was able to undertake the building of a stone castle, a process which took some years. It was therefore more usual to begin by constructing either a motte and bailey or a ringwork castle. Ringworks, as the name suggests were generally circular earthworks consisting of a bank and a ditch. 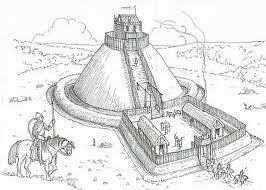 Motte and bailey castles were slightly more elaborate, comprising two parts, a raised mound (usually artificial) called a motte, which was could support a keep, and an enclosed courtyard, or bailey, which the motte overlooked. 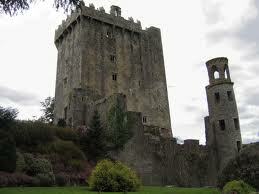 In contrast the stone castles were several storeys high and surrounded by stone curtain walls. These took some years to complete during which time the lord was left vulnerable, so therefore it is not surprising that the greatest density of stone castles are to be found in Leinster, the area most firmly under Norman control. That is not to say that castles were not important in the actual attaining of the land. Far from it. Motte and bailey castles, but more usually ringwork castles, were of particular effect as campaign castles, as they could be erected relatively quickly and the materials necessary for their construction were generally readily available. They possessed other advantages in the fight against the Irish in that they provided the Norman archers, who were employed to great effect against the natives, with a height from which to rain down arrows on anyone attacking the fortification. It may also have been preferable to fight from a motte than in the open field, given the Irish tendency to fight in rough wooded country, where the heavy Norman armour only served to make them more distinctive, and where the Irish could disperse quickly across the countryside they knew so well. Castles could also be used as offensive bases. Their ability to hold and issue forth a garrison meant that they were far more powerful in a campaign than they might at first appear. However, these advances, using strategically placed castles could also fail quite miserably. An example of this is John de Grey’s attempt in 1212 to push the boundaries of Meath thirty to forty kilometres in a north-westerly direction by a process of castle construction. 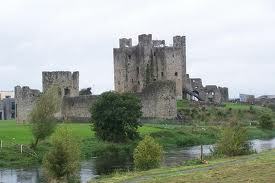 He established castles at Clones, Co. Monaghan, Narrow Water, Co. Fermanagh and Belturbet, Co. Cavan. However, in doing this he also came up against the most powerful Irish king of the time, Aedh O’Néill of Cenel Eoghain. O’Néill raised a force against him and within a year de Grey’s forces were pushed back and the castles he had built were burned. Another example is the motte and bailey Hugh de Lacy built on the site of the present day Trim Castle.This was similarly attacked and burned in 1173 by Ruaidhri O’ Conchobhair. De Lacy, however, did not admit defeat and constructed a stone castle in its stead. Storming a motte and bailey was one thing, but the Irish lacked the skills in siege warfare necessary for attacking a stone castle. As a result, the castle at Trim became a symbol for de Lacy’s lordship of Meath. De Lacy’s experience shows that castles, although of undoubted importance in laying claim to the land were of more importance in securing the area, symbolising the change in the ruling power, and thus establishing the lordship once it the land been seized. The second instance of the importance of castles to the lordship of Ireland is how they defined the physical boundaries of the lordship. The important fact here is that they defined the lordship as being plural rather than singular. Royal castles existed, such as those at Dublin and Limerick, but the status of some of the nobles’ castles indicate the independent power which they wielded. Furthermore the differences in castle construction in different regions mirror the areas under the control of different lords. An especially clear example is the contrast between motte construction in Meath, Ulster and inLeinster. Meath and Ulster had a much higher density of mottes, as well as a much higher rate of construction by those further down the social ladder.Leinster has few sites which were built on holdings of less than a full knight’s fee. A knight’s fee was a unit of land granted to a knight by the king which was considered sufficient to provide for the knight and his esquires to such a degree that they could be armed and ready for battle whenever the king called. Consequently, as higher mottes were associated with higher social standing, Leinster has more mottes of a medium (five to seven metres) and high (over seven metres) variety, while there are many more low mottes in Ulster. Too much should not be read into this as areas of high density and low density do occur within the one lordship. However, it can be seen as a further indication of the fragmented nature of the lordships of Ireland. The tendency of the lower classes to construct their own mottes in Ulster implies that it was necessary for them to create their own defences, particularly as there is little evidence of the lower classes constructing castles in the area around Dublin where the lordship was more stabilised. The Norman Castle – military base or palatial home? The functions of a castle are known to be diverse, including military means, residential, and administrative. In addition to these was the overwhelming symbolic significance of castles. In relation to the great structures of stone, as distinct from the earthwork castles, David Sweetman writes “these massive piles dominated the landscape and intimidated the people”. Although it may not be as measurable as its defensive capability, the symbolic strength of the castles should not be underestimated, for it was by virtue of this that, although it was not a complete conquest, the Normans appeared to dominate the landscape. The strength of their symbolism is obvious as these were large three to four storey structures looming over a landscape of one floor, one-roomed huts. Not only imposing by size alone, they display incredible resources of wealth and power. The only other stone buildings at the time were monasteries, and thus the Norman lords appear to have been challenging these pre-existing centres of authority. The castles at Trim, Co. Meath and Carrickfergus, Co. Antrim are two of the earliest and largest Norman castles. The sheer size of these – Trim enclosed over three acres within its walls while Carrickfergus has been described as one of the few examples in Ireland to be built on the British or continental scale – reflect on the power of their lords, Hugh de Lacy and John de Courcy respectively. Were these castles primarily military, residential or administrative in character? Carrickfergus castle for instance, might lead us to conclude that the castle in medieval Ireland was primarily a place where the lords received tenants and conducted business, for here the great hall comprises the entirety of the third floor and instead of narrow arrow loops windows which were characteristic of the more military structures, it has double-headed window lights. However, even here, military concerns are still present. only three walls had these large open windows, and the largest were on the south side, which was the least exposed to attack. In many ways the structure of Trim Castle would encourage the opinion that the primary purpose of these castles was military. The show of strength in the mural towers and the military design of the arrow loop windows support this idea, and yet it was quite possible that it was as a show of strength rather than as an actual military consideration that these features were important. This point is endorsed by the amount of space given over to residence in Trim Castle, suggesting an extensive – and impressive – staff to the lord. The image of power which they projected over their lands was as important as the reality of their military might. Finally, we come to the importance of castles in maintaining the lordship. Rare though it is, there is at least one example of a border being defended by a network of castles. That is not to say a wall of castles, rather the kind of strategic distancing which Gerald of Wales espoused, castles being distanced within a day’s ride. A line of defence of this kind occurs along the north western borders of Meath and Oriel. There appears to be a line of strategically placed mottes spanning these two regions, and the fact that these mottes occur with baileys, which renders them better able to support an army, would suggest that they were placed here for the defence of the lordships. This view is further endorsed by the fact that the direction in which they face is that in which lies the Cénel Eoghain, whose king Aedh O’Néill dealt defeat to John de Grey in 1212. But the lines of lordship could, and quite often did, change. What is different the Meath-Oriel frontier is that it may have been a more definite boundary, for it marked the frontier of lordship, county and diocese. There were also topographical differences between the plains of Meath and the drumlin country which lay beyond these borders. Rather than being a specific defence against an Irish king, therefore, they may have been constructed for the purpose of defence against raiders who would try to obscure themselves in the rough terrain beyond. Also, they could have been used as bases for night patrols. In general, the period after 1225 was one of stability for the Norman lordship. The focus turned from external to internal, to affairs within their own lordship and the lords were more concerned with solidifying gains already made. The first wave of conquest and colonisation was over and the result was an incomplete conquest of Ireland. What remained to be seen then was how the lordship would survive after their initial successes and when the flow of men from England willing to become tenants, or to assist in further expansion and become lords in their own right, began to dry up. This of course did take place and there was a resulting decrease in castle construction in the years following 1310. There are many reasons outside of the question of lordship itself for this also, such as the European famine, the Black Death and the Bruce Invasion. However the lordship of Ireland, although its presence and strength fluctuated throughout different regions and periods, remained a constant, as did the castles which defined the lords. The change in the lordship can be seen in the evolution of different castle styles, the hall house as the predecessor to the popular tower house which began to appear from perhaps as early as the latter half of the fourteenth century. The aspect of these remained quite militarily focused in comparison to the manor houses which were being constructed in England and were perceived as being “more glass than wall”. This demonstrates how the castle was still maintaining the status of the lordship, their strength and authority, not only by way of their defences but also as symbols of the lordship. It was as symbols that were to endure into even the twentieth century, when many of these ‘big houses’ as they and their more recent counterparts were known, were burnt during the War of Independence and the Civil War. Dublin Castle is probably the best example of the continuation of the importance of the castle, for it continued to operate as the English centre of control and administration in Ireland until 1922. The Normans came from a castellated society, and the result of their arrival in Ireland was an encastellation of the country. These castles were more than residences or military fortresses, they were the result of a feudal society, and it is as symbols of this that they survive best. Ultimately we can see the importance of the castle in establishing, defining and maintaining the lordship of Ireland through what they symbolised and how they functioned. The two became inextricably connected not only because they are mutually defining, but because the lordship of Ireland was actually composed of several individual lordships. In the absence of a centralised authority, the lords had nothing to fall back on but their own strength, capability and power. For these, they depended on their castles. 3 Responses to "The Castle in the Lordship of Ireland, 1177-1310"